Business incubator Novotorium introduces a new business model that offers entrepreneurs greater flexibility in initial funding levels, equity requirements and investment structure, according to Stuart Segal. Novotorium offers flexible funding, services and guidance for startup businesses ranging from initial concept through sustainable growth. Entrepreneurs in health, wellness and nutrition are working in a thriving sector of the economy, and are also creating businesses that can have a profound and lasting impact on society. Business incubator Novotorium has recently modified its funding parameters to provide greater flexibility for health, wellness and nutrition startups ranging from initial concept through sustainable growth, according to Stuart Segal, managing director of the Philadelphia-area firm that helps entrepreneurs grow their businesses. Novotorium now offers a sliding scale of initial investment amounts between $5,000 and $250,000, with Novotorium’s equity position in startups based on business fundamentals rather than preset investment amounts and equity targets. Novotorium also offers access to higher levels of capital and utilizes a variety of investment structures including preferred shares, common shares and convertible debt. “We see tremendous opportunities in these innovative ventures and have adjusted our approach to align with their business potential and capital needs,” Segal said. As a business incubator, Novotorium invests in businesses and also provides a range of services such as strategic guidance, advice from subject matter experts among Novotorium’s partners and business planning services. Novotorium also offers access to tactical business resources such as a call center, a data center, technology development, financial management, and marketing services. In early April, Novotorium announced an investment in AboutOne, a leading online and mobile family organizing platform. AboutOne’s digital family filing cabinet saves customers time by pulling information from other apps they already use, including calendar, email, socials sites like Facebook, and document management apps like Dropbox. In addition to health documents, AboutOne’s highly integrated family management system includes family memories and education, career, home, vehicle and household inventory records in the form of notes, documents, photos, and videos that you can organize and privately share. With intelligent reports, alerts, and reminders, AboutOne gives customers fingertip access to the information they need to take care of family and home. 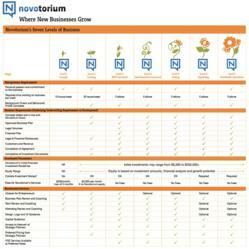 Entrepreneurs interested in learning more about Novotorium’s business model can download Novotorium’s business model chart by clicking on this link. Novotorium provides a full range of guidance, support and services for health, wellness and nutrition startups, helping entrepreneurs grow their businesses from Concept through Sustainable Operations, and every stage in between. Startups include businesses at various stages, including: initial concept, creating a minimum viable product, minimum viable product launched, second generation product launched, scaling, expanding and sustainable growth. Novotorium is conveniently located in Langhorne, Bucks County, Pennsylvania, in the Philadelphia suburbs with easy access to New York, New Jersey and the entire Philadelphia area. Novotorium accepts applications from health, wellness and nutrition startups on a rolling basis.